In August of last year the C.B.I. Navi boatyard in Viareggio launched the new motor yacht Mag II. This is a luxurious pleasure boat with four decks characterised by a modern, very refined layout. It has a displacing hull made in steel, while its superstructure is in aluminium. The upper deck, the sundeck, is on the spacious fly situated centrally and equipped with roll bar, on which are the aerials of numerous electronic apparatus supplied as standard have been located. This area includes a spacious sunbathing area and an open-air dinette with sofas and armchairs, as well as a cocktail cabinet and table. On the lower deck in the area under the fly there is the bridge, the master's cabin and a saloon. On the same level outside there are a spacious relaxation area astern and a C-shaped sofa with table in the bow . On the main deck, in the bow , there is the roomy owner's full- beam cabin, equipped with dressing room, separate toilet and bathroom, corner office and numerous leisure time accessories. 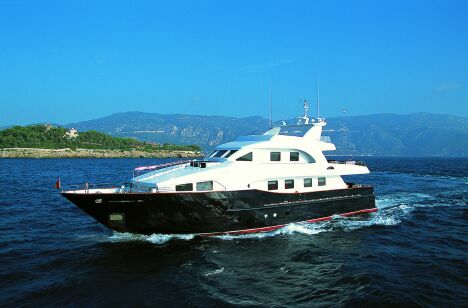 The central areas of this deck include the saloon, dinette, cocktail corner, galley, a dining room with chairs and table for ten relaxation area with plasma TV set. Astern in the spacious cockpit there is a round table with six armchairs and a sofa placed athwartship. This area can be reached from outside using the two side stairways from the cockpit stern perimeter. The lower deck hosts a spacious full beam VIP cabin amidships, in which there is an office area, a small lounge, dressing room and bathroom complete with tub forward there is a guest cabin with two beds and at the far end of the bow the sleeping area for the crew, totally independent and equipped with all necessary comforts for long sailings. For further information please contact C.B.I. Navi; via Della Spiga,52; 20100 Milano; tel. 0584 388192; fax 0584 388060; website www.cbinavi.com; e-mail info@cbinavi.com.